The Montecristo New York Connoisseur Edition is our #2 Cigar of the Year in the countdown. This was a cigar that was introduced late in the calendar year of 2011, but was introduced in time to qualify for our 2012 list. It marked the first of three regional editions released over the past year for the Montecristo brand. As the name indicates, the Montecristo New York Connoisseur Edition is available to State of New York brick and mortar retailers only. This was the fourth major brand to make a New York only cigar, and in our opinion this one stands at the top of all released. 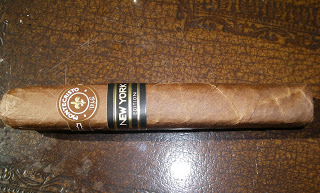 The Montecristo New York is the second cigar by Altadis and the Montecristo brand to make the 2012 countdown. It also marks the first regional release ever to qualify for the Cigar of the Year countdown. The Montecristo New York leverages an Ecuadorian Habano wrapper and is the fifth cigar on the countdown to use this tobacco for wrapper. While the Montecristo Epic Vintage 2007 (which was our #11 cigar for 2012) got all of the attention for Montecristo in 2012, it was the Montecristo New York which really stole the show in our books. The Montecristo New York’s blend differs from the Montecristo Epic. The cigar was originally introduced in a 6 x 60 box-press vitola. The cigar proved so successful that a No. 2 box-press torpedo was added later in 2012. The flavors to the Montecristo New York were nothing short of amazing. The flavor notes delivered by this cigar include: dried fruit, chocolate, baker’s spice, raisin, cream, natural tobacco, citrus, and red pepper. The flavors are robust and full-bodied. The cigar is also medium to full in strength. The cigar got better throughout the year. Even though we did not have a perfect burn when we assessed it, subsequent smokes did not have this issue. Click here to read our original assessment of the Montecristo New York Connoisseur Edition.